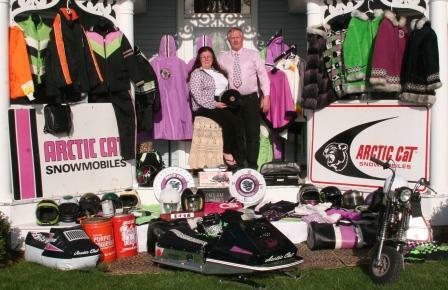 Two collections you'll get to see at the Arctic Cat 50th Anniversary Celebration are those of Ken & Becky Kranz, and of Wayne & Cindy Kuster. Becky and Ken (above) are from West Bend, Wis. 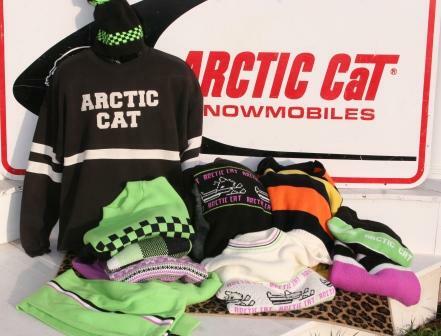 In addition to many antique and vintage Arctic Cat snowmobiles (including a 4-cylinder King Kat), the couple have amassed what might be the largest collection of vintage Arcticwear in the world. The photo above contains only a fraction of their gear. 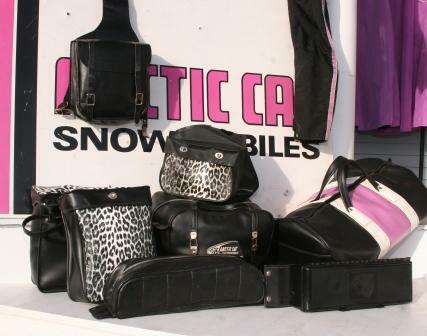 According to Becky, they have an example of nearly every Arctic Cat clothing item from 1967/8 through 1981. Amazing! 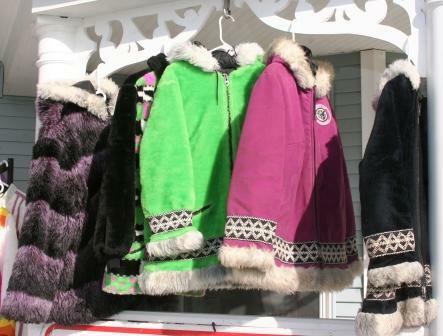 If it's cold in TRF next week, they'll have some sweet faux fur to keep them nice and cozy. Perhaps when they're taking ATV test rides at the 50th, they might use one of these helmets? Many additional items to accessorize with. The fashion police will be out in full force. ...and plenty of storage space for additional swap meet purchases. 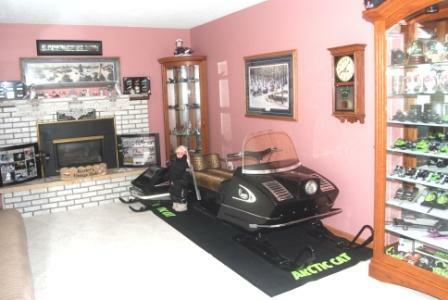 You won't find a nicer couple of Cat collectors than Wayne & Cindy Kuster (above) of Grand Forks, N.D.
You also won't find too many collectors with a ultra-rare 1968 Arctic Cat Cougar (with bogie-wheel suspension) parked in their living room. 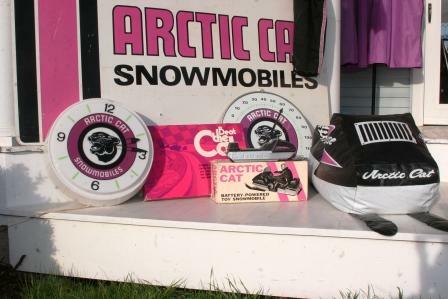 Same goes for a 1972 Kitty Cat and loads of cool Arctic Cat memorabilia. Pretty amazing display! 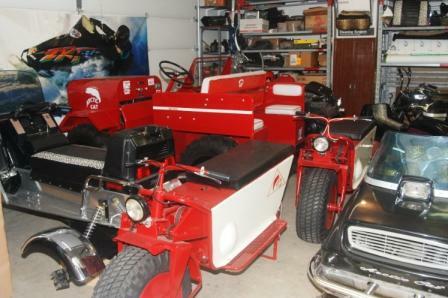 The Kusters own more than 50 Arctic Cat vehicles, including the two rare Cub motorbikes and Ultra-rare (fewer than five) Model 1000 4wd machine shown here, in their garage. The last time I spoke with Wayne, he was planning to bring A LOT of these machines to the 50th. The Kranz and Kuster collections are just some of the amazing artifacts we'll see next week at the 50th. I'm practically jumping out of my skin in anticipation. 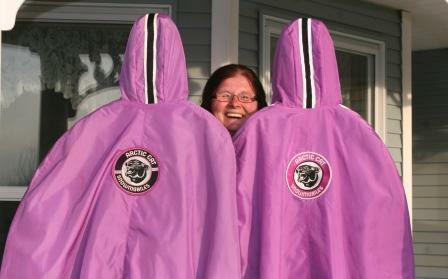 If I do (jump out of my skin), I'll see if Becky can loan me a cool jacket to wear. 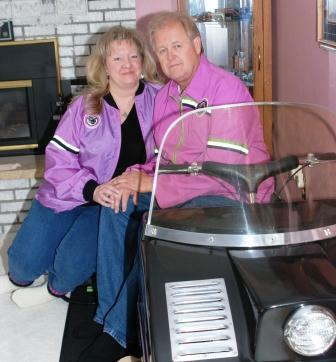 I had one of those inflatable house cats strapped on the back of my Goldwing at the ARCTCO fifth anniversary party. Some lady from Eagle River made some smart azz comment about it, she didn't have a sense of humor at all. Paid half a buck for it at a flea market in Baraboo, what the heck! s.t.i.c.s. : Are you sure she was referring to the House Cat? I've seen pix of you...I can imagine other things to comment on. Wayne, I hope you bring the Cub with to TRF. I'd like to see my old Cub again. I'm sure its restored better than when it was new. 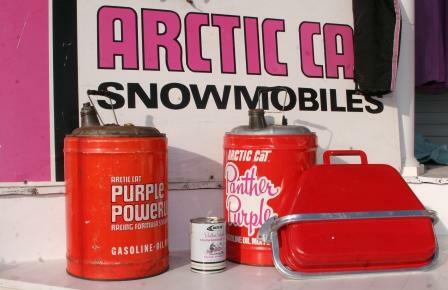 Wayne and Cindy have put together the best of the old Arctic items I have ever seen. Nice collection. Was just wondering how ultra rare the cougar with bogey wheels is. I found one and it needs total restoration. Thanks for your time.